So, if you're at all squeamish about bugs and stuff in your food, don't read any further! We have had so much gorgeous and warm weather for June, here. And now the cherries are all ripening about 2 weeks ahead of schedule. Okay, so here's the buggy part. . . our cherry trees have been infested with currant fly (and yes, our currants are also infested). The cherries are only partially hit by the larvae, so not a total loss. But in not wanting to lose the cherries, I have been pitting and splitting all of them open, picking out larvae, before serving with dinner. I'm sure there are many that I miss, but at least nothing staring back at us, when we take a bite. Why am I telling you about our buggy fruit? A lot of our homegrown produce gets hit with one sort of pest or another. Lettuce and strawberries get a little bitten by slugs. The kale gets the occasional cabbage worm. And spinach and chard gets hit with leaf miner every year. Usually, I just cut around the ruined part of the veggie. We just don't worry too much about it, and I do what I can, organically, in the garden to minimize infestations. And yes, I have cooked a pot of homegrown broccoli before, only to find a few cabbage worms in the cooking pot at serving time! I figure that a few bugs have always been present in the food supply. Perfect-looking produce is a modern ideal. Our garden fruits and veggies would never pass inspection at an upscale market. I tell my kids all the time that a slug bite here or there is evidence of how free of chemicals our fruits and veggies really are. And hey, a little extra protein, free of charge, can't be all bad! So, what's my point here? I know that some of you also have home gardens. And if you do, you've had your share of pest problems in the garden. And I'm willing to bet that you have also just cut away the buggy part, and eaten what's still good. To me, that just seems like the sensible thing to do. In my opinion, it's all about food waste. We, Americans, waste a lot of otherwise good food. I see people cut about 1/3 of their strawberries when they hull them and I say to myself "what a waste". Then the broccoli stem is cut off and thrown away so only the flowerette is eaten and it bothers me. My kids have always been served as much of the stem as part of the broccoli at meal times. How about all that bruised fruit in stores? I often will make a beeline to the discounted produce rack and will always buy my "fresh" fruits and veggies there. It is always salvageable. I will always cut around bug eaten fruit or veggie to make sure the rest of it doesn't get wasted. It would be awesome if all fast food restaurants and processed foods just went away sometime. Most people wouldn't even know what to do to get their next meal! I know what you mean. With our homegrown strawberries, you don't even need a knife to hull them. The caps come right off with my fingers. When my daughters were helping me in the kitchen one day, with the strawberries, I noticed they were cutting off the green portion, taking a lot of berry with it. I quickly showed them how you can just pull the caps right off. Even when the produce is free from the garden, it still food and I don't want to waste any of it! The statistic that I've read is Americans waste 40% of the food supply, and imperfect produce is a major contributor to that number. I now wonder what's happening with all of the broccoli stems, these days? Most of our local stores only sell the crowns now. I've always cooked the stems, too. I peel the tougher sections, but the inner core of the stem is still very tender and delicious. The frozen broccoli "cuts" seem to contain mostly stems. Maybe they use them all for that? oh, could be! And maybe some is sold off to make broccoli slaw? We also cut off as needed, rinse, and eat the rest. I'm not sure if I'd have your patience with the cherries, though, on a big scale like that. Cherries are a scarcity here (Oklahoma) so we buy a few each summer but they aren't plentiful. We planted our own trees (Rainier and Montmorency Tart) this year and are hoping to eventually have a crop. I'm sure you are already salivating over the prospect of your very own Rainier cherries! I hope your trees produce well for you. My fingernails will be purple for the next couple of weeks, but oh well, we'll be enjoying cherries as a result! Our second tree is very full of cherries this year. I'm thinking of drying some of those. They dry faster once halved. So, I'd have to do this sort of work anyway. Oh, I'm so sorry your fruit trees won't be producing this year! That's frustrating! It happened with our apples trees this spring, here. We had a late frost, right as the apples were in bloom. We lost one whole tree over winter, and are now down to 4, and on those 4, only about a dozen apples in total (down from hundreds the year before). Yes, hopefully a better year for you next year! Sorry to hear you have trouble this year, too! We normally do pretty well, though two years we had a bear tear up several of our really old trees, which broke our hearts. Decades of water and care down the drain overnight! She said that they weren't "great" peaches, but I told her, even so-so peaches usually taste pretty good in jam! :) Now, I just have to get over to her house to pick them up and drop off some household items I'm giving her in return. Ouch that would "hurt" to have a bear come and tear down one of our trees! Those peaches will be wonderful, I'm sure. And you're right, peach jam from even so-so peaches will still be delicious! We grow our veggies (just kang kong, green onion, chinese spinach and basil for now) in a few pots on our lanai. This amount of gardening has been convenient to have for the small amount of fresh greens needed in our cooking and to augment the vegetables we usually purchase. Maybe next year we will plan a real garden. Even in our few vegetable pots, we have bug problems. I searched the internet to find out what those puffy white bugs are, and cannot identify them. So I just squish them away, and we eat the less ravaged leaves. I'm glad you wrote about your buggy problem because this makes me feel better about salvaging our vegetables. There is too much waste in our country as we seek and expect to eat perfect tasting dishes (the advice given about buying produce is do not buy bruised, so what do we expect?) I go back to my adage that we should eat for nutrition sake, not for taste and to enjoy food so much. I buy damaged produce all the time, at the supermarkets and produce stands. I will stop at moldy fruits however. We've called our porches "lanai" and didn't realize these outdoor living spaces are called different names depending where you live. So colloquial!! "Lanai" conjures breezy, sunny outdoors, and calling your deck, "lanai", may certainly bring tropical conditions as well!! I don't know what happened to my reply but it got lost when I clicked on "publish"...said I need to type a message?? I grew up calling our porches, lanai, if it catches the outdoor breeze. I googled and found out "lanai" is regional...these structures are called different names, depending on the geographic location. But why not, deck sounds like a stage for parties and lounging... maybe a name can change the atmosphere!! Blogger is acting up apparently, today! Yours is not the first comment to get sucked into the "awaiting moderation" black hole! This has happened on a few comments today. I like the different names for porches/decks. "Terrace" is the other name that sounds wonderful to me. Last year I bought a bushel of corn without a single worm in the entire bushel. It made me cringe to think of what toxins were used on the corn or worse what had been genetically modified to produce corn resistant to worms. Bugs, worms and critters should occur naturally in naturally grown foods. I am a firm believer in washing and cutting them out. That's just it, how many poisons are we willing to ingest, for the sake of perfect-looking produce? I understand that a small amount of pest control can save an entire crop to feed to people, but do we need the overkill in pesticides, is my question. I hold pesticide-use as a last resort for our fruit trees, here. In addition to doing a thorough clean-up under our trees, I plan on using worm castings as a top dressing on the soil (destroys the larvae as they go into the soil and come back out in spring), then use sticky traps to catch some of the flies. It should help with some of the bugs for next spring, and leave us with fewer problems in the fruit, without using pesticides. If that doesn't do enough for us, then I'll look at the safest spray on the market, first. I'm with you on just washing and cutting the critters/damage out! Unfortunately, we get insects very early into our peaches every year before they can ripen. If any of the peaches make it to picking stage, the birds or squirrels eat them before they are picked. I have just give up and enjoy the blossoms and the local peaches grown by someone else. I don't know anything about pest control in peach trees, but I wonder if you could minimize the bugs, at least, with similar controls to what I'm doing here? Earthworm castings are abrasive to insects that infest cherry trees. And then sticky traps can "catch" hundreds of the flies. Oh course, then there's the birds and squirrels. A big problem for us as well. Since the cherries ripen relatively early, I simply chase those off from our yard through early July. But maybe your attitude is a beneficial one for you, to just enjoy the view of the blossoms, and buy or obtain someone else's fresh peaches. It is work to really manage fruit trees. Grew up on "distressed" fruit , that's what it was called at our local Safeway growing up. My mother was a saint and methodically cut off the bruised parts. 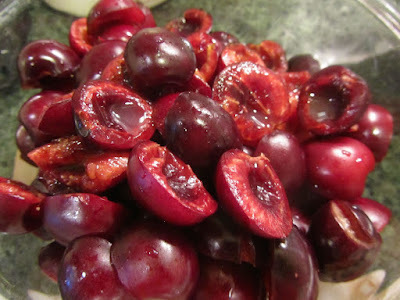 It was wonderful, she was the ultimate gleaner:) I think I ate more cherries when I was growing up then I do now. It seemed with the way fruit was palletized and shipped she could easily get a crate of something for next to nothing and quickly process, removing the softer fruits and cleaning the box up. She had the time the grocery manager did not/could not /would not have spent. Oh, your mother sounds inspiring! At one of the produce stands that I frequent, they put bruised or overripe produce into boxes and sell for $2 or $3 per box. Sometimes it's an awesome deal, depending what's in the boxes. When my kids were small, they would leave a large section of edible fruit still on a slice of watermelon. This bothered me so much that I started cutting off the green/white part, making sure that all of the red part was still on their serving on the plate. And I did the same with apples, cutting out the core, as close to the core as possible, so they would eat all of the edible portion. My mom always did this with apples for my sister and myself. In our school lunches, we never got a whole apple, each, as we would waste a good part of it, surely. But we would get half an apple, cut close to the core, each. That insured we would eat every last bit given to us. I lie the visual of your eaten apple cores -- like in a cartoon! I can just imagine it! At the music school where I used to work there were a lot of strict vegetarians on the faculty. One fellow (who wasn't a vegetarian) was fond of teasing them, saying that if they ate canned beans or peanut butter they couldn't really call themselves a vegetarian because the FDA actually allows a certain amount of maggots, spiders, flies, and other insects (not to mention excrement, dirt & other "foreign matter") in all canned foods. my son is fond of telling me about how strict a vegan/vegetarian can be, with not eating strawberries, because of the tiny mites that live under the seeds on the outsides of the berries. I may sound like a lazy mom with this, but my attitude with regards to bugs in fruit -- I try to get them out, but if I miss a few, and it bothers someone in my family, well they're free to pick them out themselves. I served berries over dutch baby yesterday, and apparently I didn't get a tiny worm off of a raspberry that went onto one of the plates. That family member chose to pick it off. Oh well. I work hard in the kitchen, but I can't be perfect. The main protein source available in many markets in Asia are insects. It's a cultural thing for Americans and other westerners, I think, Teresa. I don't think I could eat a plate full of bugs, but then again, I didn't grow up with that as a "normal" meal entree. But I have definitely eased up with how I feel about a couple of bugs in our homegrown produce!